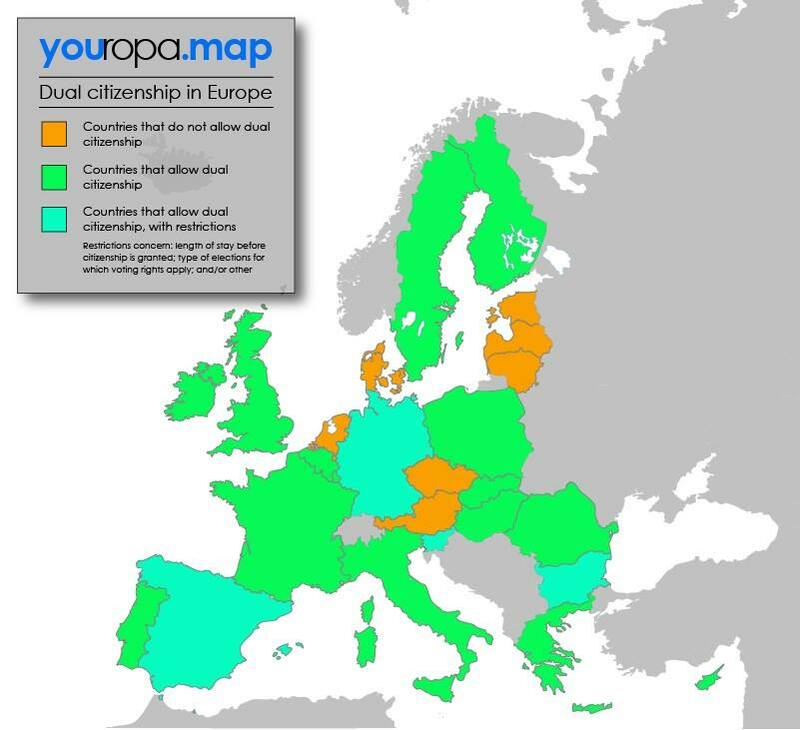 Dual citizenship in the EU. Most of the discussions about access to Scottish citizenship after independence have been about expat Scots and their descendants (as well as the related discussion about rUK citizenship for Scots). However, I believe there is a bigger problem closer to home, concerning those who can take part in Scottish Parliament elections (and because of that also in the independence referendum), but who will lose that vote after a Yes victory, namely EU (and possibly Commonwealth) citizens resident in Scotland. The SNP’s 2002 proposal for a Scottish constitution (PDF) suggested granting Scottish citizenship to everybody living in Scotland on independence day (“Every person whose principal place of residence is in Scotland at the date at which this Constitution comes into force shall be a citizen of Scotland”), but the white paper states that only UK citizens will be Scottish citizens from day one, and that migrants are restricted to applying for naturalisation after independence, and only if they’ve lived here for at least ten years and are of good character (see the table at the end of this chapter). This means that there’ll be a significant group of independence referendum voters who will effectively disenfranchise themselves by voting Yes in September. Some of them will just apply for Scottish citizenship afterwards, but a large group won’t qualify or will have their own reasons not to do so. For instance, Denmark and several other EU countries don’t allow dual citizenship to be acquired. It’s allowed if you’re born with two nationalities, or if you can get another one without applying for it (this typically happened in the past in some countries where wives automatically got their husband’s nationality on marriage), but if you apply to become a citizen of another country, you lose your Danish citizenship. In other words, it wouldn’t cause any problems if Scotland granted Scottish citizenship to all Danish citizens living in Scotland on 24 March 2016, but if they have to apply for naturalisation, they will lose their Danish nationality in the process. At the moment, EU citizens living in Scotland can vote in all elections, apart from the Westminster ones. However, after independence Scottish Parliament elections will not be local elections any more, and EU citizens cannot vote in general elections in any other country, so I’d be surprised if Scotland was an exception. (The UK currently lets Irish and Commonwealth citizens take part in Westminster elections, but most other countries restrict voting in general elections to their own citizens.) If there are plans to let all EU citizens resident in Scotland vote in general elections after independence, please do let me know! The result of this is that EU citizens living in Scotland are likely to lose their right to vote in Scottish Parliament elections when Scotland becomes independent. This is hardly a great incentive to vote Yes. I strongly believe we can maximise the foreign-born Yes vote by granting Scottish citizenship to everybody who can take part in the independence referendum, not just to British citizens living in Scotland. You have come up with quite a nugget here. It would be interesting to know how many people would be adversely affected if this proposal came into effect. It is of course important to note that this is just the SNP proposal. While they will carry great weight when it comes to deciding what to include in the constitution, other views will also be heard. This post should encourage others to think more carefully about these issues. Yes, indeed. I’m well aware the White Paper is just a proposal, and that there will of course be legislation required, and as part of that there’ll be extensive consultation, so I’m hopeful the rules might still change. As for the number of people affected, I’m not entirely sure how to find out. It should be relatively easy to find an approximate figure for the number of EU citizens in Scotland, but how many of these are not British citizens because they don’t qualify (yet), and how many of them just aren’t interested? It claims Holyrood elections will continue to be regarded as local elections after independence, but that’s just silly. Holyrood elections will become national elections so the entire article is based on a fallacy — UKIP scaremongering. I was at the last SNP conference where IIRC a motion was discussed to give all EU citizens the vote in national Scottish elections. Again IIRC this was passed by acclaim and AFAIK represents the SNPs stance on the issue. Basically that “citizenship” becomes less of an issue than residency. Whether this translates into policy likely depends on conversations and debates to be had in a national constitutional convention post Indy. But I heartily support the idea and many other SNP members also do. It fits very neatly into the idea of civic nationalism on which the case for Independence is founded. I hope you’re right, but if that’s the plan, why didn’t they add it to the White Paper? That would be a great message to send to all those voters who are here as EU migrants. Since the White Paper came out I have been trying to get clarification from all the Yes side sources, campaign, govt, supporting parties, FB pages, that Scottish children of exile, born in rUK and unable to move back here before indy day, will be citizens by right, that the state won’t have any power to say no to their applications. It should have been routine to clarify this straight away, instead nobody will say even this, and this has made me a No voter. What’s more, on Feb 23 SNP MP Angus Macneil denied they are Scottish. An ugly pattern of anti-outsider racism is emerging on the Yes side, applying even against our diaspora. It certainly overturns the previous impression that EU citizens were safer voting Yes – you have shown they appear to be safer voting No. I’m not sure why these clauses haven’t been pointed out to you before. I wouldn’t say EU citizens are safer voting No. Firstly, as endless_psych pointed out, the SNP is in favour of giving them the right to vote after independence, too. Secondly, there is a huge risk that the UK will leave the EU, which would be a disaster for EU citizens living here. That quote only comes from under “after the date of independence”. referring to the children of exile born after then. It does not cover those already born before indy day and living now. For them, it was the “can register” line that I enquired about from the start, and in another place only the weaker wording “can apply” is used, as in “other people can apply”. If you can tell me now from a source with policy authority, that anyone who “registers” or “applies” for citizenship in this descent category will automatically get it and the state won’t have even in theory any power to say no to any of them, then I won’t argue I will laud forever your place in our history and so will the many voters with cross border families who you will win back by it. Why then has no Yes side source yet been willing to give me that answer? I’m not sure that clause covers only children born after independence day, but you’d need to ask the Scottish Government to confirm that. If no other evidence than birth cert is going to be allowed, I hope it includes obtaining a new copy of the birth cert from register house? Anyway, to say it’s automatic is just an interpretation of the White Paper. I hoped it meant so too, but checked, and failed to get the right answer to checking. Then the wording of Yes newspaper no 2 definitely indicates otherwise. It referred only the birth and indy day residence categories and nobody else at all as having the “right” to citizenship. That’s what caused my reaction. So to make it automatic still needs a policy authority to confirm the actual word. Obviously the White Paper is just a White Paper. It’s not a law. It’s to be expected that the laws of an independent Scotland will be based on the White Paper, but it is “just” the proposal of the current government. Based on the White Paper, I wouldn’t be worried about the ability for children with UK passports Scottish-born parents to obtain Scottish citizenship, but nobody can guarantee the exact wording of the citizenship law post-independence, just as nobody can predict the future after a No vote with accuracy, either. I would have to agree with tern on this one. The white paper has not been very clear, neither, dare I say, fair. The inconsistencies in the official statements made by the leader of this campaign indicate trouble down the line. The new government should adopt a theme and stick with it. Alex tried to portray iScotland as a new, modern, open and democratic new nation. We all believed him. In a statement made in New Zealand, Alex Salmond was quoted saying on record, anyone in the world born in Scotland is automatically a Scottish citizen. This statement will never be found now. Try looking for it. If you do, Alex and the SNP will never tell you why they mysteriously and unethically retracted their statement. It says a lot about the ethics and the merits of the new government. I am a Scottish born person to non UK nor EU citizens. I have lived in Scotland until age 8 and had to leave. I have no rights whatsoever to claim citizenship, despite having been born, and lived in Glasgow. But a migrant from say Romania who got to Scotland three days ago, could become citizen by Christmas. Violation of human rights, and discrimination based on national origin seems to be the name of the game in independent Scotland even before they get their independence.